(Nanowerk News) Tests of the new high-resolution electron microscope TITAN CUBED 80-300 has been just finished at the Institute of Physics of the Polish Academy of Sciences. The microscope is one of the best facilities of such kind in Europe and allows for the comprehensive examination of materials used in nanotechnology and spintronics. Its regular work will start in January 2011. The high-resolution transmission electron microscope TITAN CUBED 80-300 has been set on work at the Institute of Physics of the Polish Academy of Sciences (IP PAS) after four months of tests and installation works. This scientific facility enables quick and accurate characterization of semiconductor structures used in production of lasers and diodes and all electronic devices based on nanostructures and quantum effects. "Electron microscopy have been the subject of our interest for more than 35 years. TITAN guarantees to carry on our investigation on the highest world level," says Prof. Leszek Sirko, scientific director of the Institute of Physics of the PAS in Warsaw. 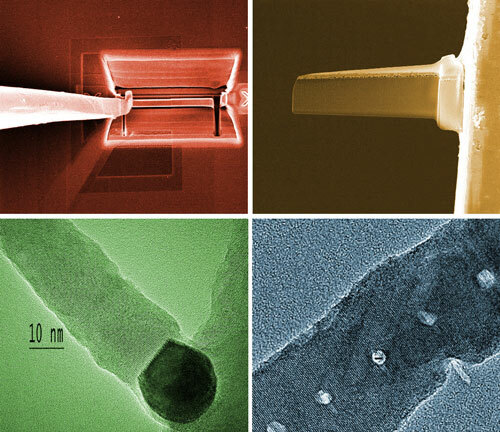 High-resolution transmission electron microscopy (HRTEM) is invaluable technique to study nanoscale (10-10 m) properties of crystalline materials such as semiconductors and metals. At these small scales, individual atoms and structure defects can be imaged. "So small objects we are not able to see by use of visible light," explains Kamil Sobczak, PhD student at the Electron Microscopy Group of IP PAS. Instead of beam of light, a beam of electrons is used to "illuminate" the investigated sample. Microscope is build of vertical column, on top of which the electron gun is placed. Below the gun is the system forming electron beam composed of monochromator and electrostatic and electromagnetic lenses. After passing through the sample, the transmitted electron beam comes through the system of lenses which form a sample's image magnified millions times. The investigated sample should be very thin (its thickness should not exceed 1 micron) so special techniques of its preparation must be used. An additional equipment – a device for focused ions milling (Focus Ion Beam, FIB) has been bought, which allows for very efficient sample thinning. "At present, sample preparation takes us about one week (with standard techniques). By use of FIB a sample will be ready after a few hours," says Alicja Szczepanska, technologist at the Electron Microscopy Group at IP PAS. "On the basis of results of microscopic investigations we will be able to inform technologists, which color of light can be emitted by a selected part of investigated device," says Prof. Piotr Dluzewski, head of the Electron Microscopy Group at the Institute of Physics of the PAS. The new microscope will be used by many scientific groups from Poland and abroad and many commercial companies. It will also give an educational possibilities for young scientists and students. Project "Analytical High Resolution Electron Microscope for Nanoscience, Nanotechnology and Spintronics" has been granted by European Union in frame of Operational Programme Innovative Economy to support infrastructure of leading scientific institutions (action 2.1). European grant covers 85% of costs, the rest was covered by the Ministry of Science and Higher Education of Poland.